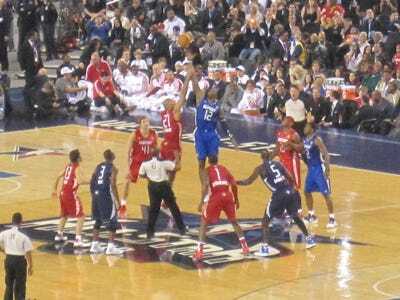 All-Star Weekend 2010 in Dallas. As we approach the NBA All-Star break, many front office staff, coaches, and players will be going on vacation and enjoying three days off of work. On the flip side, fans, players, and media will also be flocking to Los Angeles for the All-Star festivities.As NBA players and owners meet to negotiate the new Collective Bargaining Agreement (CBA), many of the people that provide the entertainment we enjoy during the All-Star break are actually working. I took a look at the section of the current CBA (which expires after this season) related to the NBA All-Star game to see what the players are banking. For their participation in an All-Star Skills Competition, players shall receive the following amounts: Slam Dunk and Three-Point Shootout: 1st Place: $35,000, 2nd Place: $22,500 **** There are additional payouts for players who place lower in both of these competitions. Slam Dunk and Three-Point Shootout: 1st Place: $35,000, 2nd Place: $22,500 **** There are additional payouts for players who place lower in both of these competitions. A check for $35,000 is ashtray money compared to the multi-million dollar salaries these athletes are used to making, but it’s still a nice chunk of change. If you’re like me, you might be tired of people saying that some players don’t really care and that this weekend doesn’t matter. I’d argue that it does. Let’s not underestimate the ultimate prize. No, I’m not talking about money; I’m talking about PRIDE.